Although lesbian and gay studies have been a recognized academic discipline for more than a generation – the first undergraduate program in the U.S., for example, is reckoned to have started in 1970, only a year after the Stonewall riots – until the past 10 years or so a lot of its scholarship might find itself relegated to the backwaters of academe. 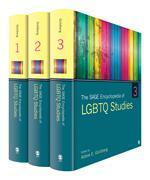 But not today, notes Abbie E. Goldberg, the editor of a new three-volume The SAGE Encyclopedia of LGBTQ Studies. Some of that excitement is shared by Goldberg’s peers. The Society for the Psychological Study of Lesbian, Gay, Bisexual, and Transgender Issues, a division of the American Psychological Association, has named the work its 2016 Distinguished Book. Goldberg was honored with the award at the annual APA meeting this month. Goldberg has been an important voice in the field, especially at the intersection of families .and sexual identity, through her Diverse Families lab at Clark. She’s already written two books on the topic, 2012’sGay dads: Transitions to adoptive fatherhood and Lesbian and gay parents and their children: Research on the family life cycle from 2010. She also edited, with Karen Allen, the 2013 collection LGBT-parent families: Innovations in research and implications for practice. Her current research includes studies of post-partum well-being among women with diverse sexual histories and a longitudinal study of adoptive couples, again with diverse histories. How do you create a reference work, which almost by definition is meant to be definitive, in a field that is seeing so much change so rapidly? Understandably, we will continue to see shifts in the legal and social landscape in the coming years. Many of the entries will probably need to be updated in the future. However, the vast majority of entries represent and reflect a summary of existing work in a particular area (e.g., asexuality, or bisexual men’s aging experiences, or couples therapy with sexual minorities), and, thus, will not become obsolete in the near future. Not to embarrass you, but what do think might have made this work award-worthy? The range of topics/entries; the high caliber and skill of the contributors; the excellent editorial staff; the beautiful and high quality production; and the fact that no such reference work exists. I like big projects (I am the author of two solo author books) and I enjoy editing (I have one published edited book on LGBT parent families, with Katherine R. Allen, and I am currently editing a book with Adam Romero on LGBTQ relationship dissolution and divorce). I’m also passionate about raising the visibility of LGBTQ studies as a field. The idea for the project came about after talking to a very special acquisitions editor (Maureen Adams) with whom I had worked with in the past. Great ideas, at least for me, usually don’t come about in a vacuum. They are the result of multiple conversations with other passionate people who know how to ask the right questions and recognize a good idea when they see one. Do you have any tips for anyone else ever asked to do a similar encyclopedia project, regardless of the discipline? Garner a top-notch, trustworthy, and conscientious group of associate editors who are diverse in background and discipline, and who know different groups of scholars who you wish to access. My associate editors are a diverse, special, and highly skilled bunch, without whom this project just would not be. They recommended authors, provided excellent feedback, and kept me from drowning in drafts! From your vantage point at the intersection of families, gender, class and sexual orientation, care to make a prediction of what psychology might look like in a decade or two? How about society itself? My hope is that psychology and other related disciplines – e.g., sociology, family studies, gender studies – continues to allow itself to be tested, challenged, and nuanced by including the voices and perspectives of groups that have often been marginalized in research (as participants) and in the academy (as scholars). Allowing the voices of sexual and gender minorities to be heard has the potential to truly expand what we think we know about identity, families, development, and many other important domains.